After getting my latest installment of the Spunky Club fiber in the mail the other day, I spent two evenings spinning up the October and November fibers. They are gorgeous! I spun this very quickly with some sort of modified worsted long draw technique, pulling back with the fiber hand instead of forward with the forward hand, smoothing a bit as I went. It’s nice and airy and has great drape. 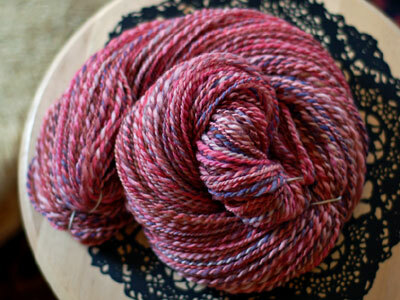 I finished this skein with only a warm soak. I spun this one in the same manner, though the wool wasn’t so long and slippery as the Romney, so didn’t go quite so fast. This one has more twist in it than the Romney, so it’s really springy. To finish this skein, I fulled and whacked*. It became very squishy and bouncy. I noticed that the Falklands wool top was really directional, meaning that it was a lot nicer to spin from one end. I figured I’d take a photo and talk about it, since it’s not something I see mentioned often. It’s easy to see that the two opposite ends of the same piece of top above are different. When I tore off a length of the top, one end came to a point and the other tore off pretty much straight across. This is because wool fibers are like human hair in that if it’s combed in one direction, there’s more resistance than if it’s combed in the other. When combed or carded, the fibers align themselves so there’s the least resistance possible. It’s often easier to draft fiber in this direction as well, which explains why that end pulls into a nice point. Sometimes, the difference when spinning isn’t very noticeable to me and sometimes it’s drastic. The pointy end is generally the end you want to spin from. Sometimes it’s hard to see the point, so give a spin and if your fiber is giving you any lip, tear the wool off and try from the other end and see if you notice a difference. 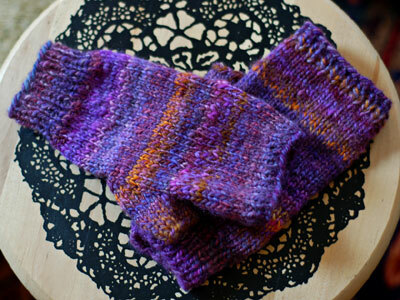 These are knit from the same yarn as the leg warmers. Hooray for leftovers! They are Kolenya (PDF) fingerless mittens modified to lose the little crocheted chains between the fingers (stuff between my fingers and toes is annoying). They used 2 oz. of bulky 2 ply BFL and Corriedale wool yarn, unknown yardage. It’s a great, simple pattern for a little bit of handspun. They’re nice and toasty! * Fulled and whacked?? 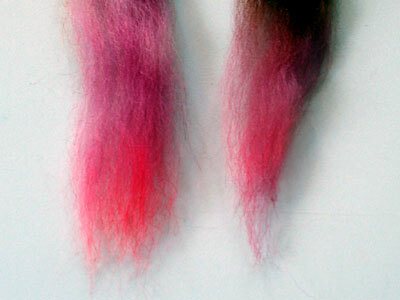 I think crimpy, shorter staple wools and other animal fibers benefit from rough treatment after spinning. I soak them in hot water with shampoo, dunking them in and out of the water a few times before letting them settle and sit 15 minutes or so. After draining that water, I then refill the sink with cold water and repeat the dunking and soaking. The water temperature change fulls the yarn and causes the crimp to go crazy and plump up. Yarns spun from crimpy wools like Merino bloom wonderfully with this treatment. Fulling a long-stapled fiber yarn can cause it to felt to itself and get hard, so take care with those. I just soak them in warm water with shampoo and rinse. There’s a great article about this in the Summer 2007 Spin-Off with lots of pictures. Whacking means that after the yarn has been washed, I squeeze the water out, grab one end of the skein, and beat it against the side of my bathtub, rotating the skein and repeating. This helps even out the twist in the yarn, and gets some of the water out, too. 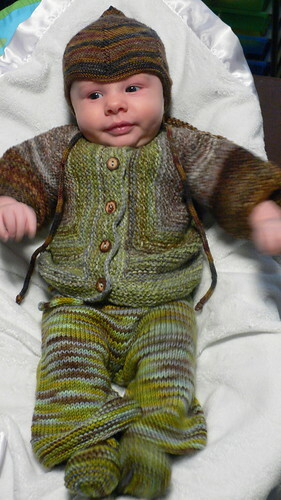 I do this with any skein that I think can handle the beating, which is everything but some novelties. The first installment of the new fiber club is packaged all up in boxes, waiting for the mailman by the front door. I think he might be avoiding the house today, because heâ€™s been warned about how big the shipment is! :P Non-US members, your packages are already winging their way to you. I hope you all love it! 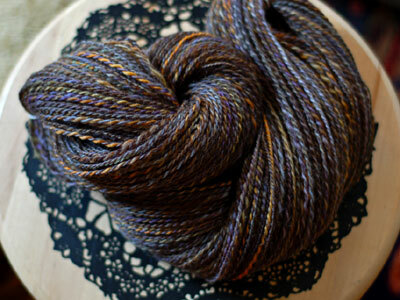 Itâ€™s another new fiber and a great one Iâ€™ll be carrying from now on in the shop in both dyed and un-dyed forms. The club is shipping a little late this month, as I shoot for the middle of the month for that, and itâ€™s because there are so very many of you in this installment, and a lot of you chose doubles. (Totally not complaining, you understand, just explaining!) The amount of work caught me by surprise, but the main problem was drying it all. As of last night, I have rented super lovely official Hello Yarn drying and storage space, so next month, there shouldnâ€™t be an issue. Iâ€™ll be back soon with spun yarn and cannot wait to see what everyone does with their fiber. This is cross-posted to the fiber club blog to be sure everyone sees. Holy crow, has everyone seen No Country for Old Men? It is definitely the best movie I’ve seen in a LONG time. It just about gave me a heart attack and Javier Bardem is forever changed in my eyes. You’re a better woman than I if you can manage to not hide your eyes a time of two. Go see it!